Mangaluru, Mar 23, 2017: The Director of Father Muller Charitable Trust Fr Patrick breathed his last after his battle for life against Cancer on March 23 , Thursday at 7.45pm. Fr Patrick was born on August 17, 1951. 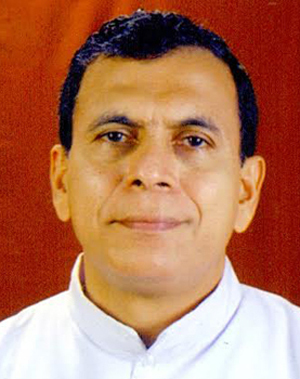 He served as Assistant Parish Priest of Barkur in 1978 - 1981, Assistant Parish Priest of Kinnigoli in 1981 - 1984, Parish Priest of Sampaje in 1984 - 1985 , Assistant Director of Father Muller Charitable Institution in 1985 - 1991 , Administrator St. John Medical College, Hospital in 1991 - 2000, Assistant Director of St. John’s Academy, Bangalore in 2000 - 2003, Parish Priest of Kinnigoli in 2003 - 2007. He was appointed as the Director of Father Muller’s Charitable Trust in the year 2007. His last rites will be performed on Sunday March 26 at 3.30pm ,Infant Jesus Church, Bantwal. Sad demise of Rev Father Patrick . May the eternal soul rest in peace.